6018North began in response to its richly diverse community. We began with a given people, in a given place. We asked if art can bring people together while respecting the pre-existing conditions of an old home, in a low-income, diverse neighborhood. We did not seek to change the house nor the people in the neighborhood, but bring people together to connect the uniquely diverse community. We sought and still seek to bring neighbors and artists together to create new opportunities and new ways of seeing and understanding the world. We propose this as a sustainable model. People living in diversity and with limited access to levers of power understand this. You make do, working with nature, with each other. This is sustainable. We believe in contemporary art, yet respect history. Surely these are not mutually exclusive. With climate change and the planet warming at a rate vastly faster than predictions, it is disheartening that Loyola University plans to tear down two 100 year old buildings at 6314 N. Winthrop and 6330 N. Winthrop, perfect candidates for green rehabbing The greenest building is not a LEED building, but the existing building with green updates. Those who claim to be forging the future using short-term, economical solutions end up short changing that future. With the 2030 UN Climate change panel challenging us to take “unprecedented” actions, we need to change business as usual. For this reason, society often looks to non-profits and religious organizations, such as Loyola University, to employ long term objectives and alternative approaches that respect the past and planet, since these appear to be inconvenient to short term plans and profits. Life is short and people who follow the easy route, often don’t forge the future. 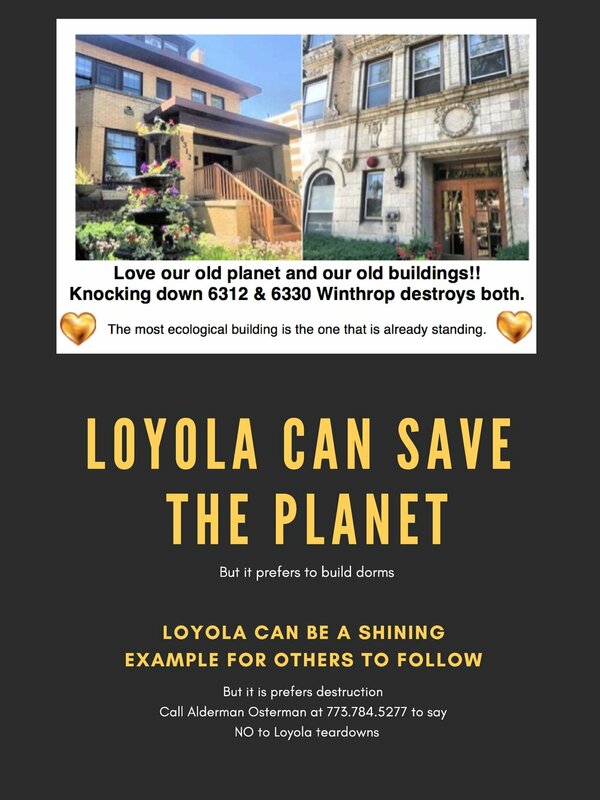 This is a wonderful teaching moment for Loyola to advance its students’ stewardship of history, community, and the planet, while striving for quality of life and prosperity. This is the ultimate challenge we face with our environment - how to move forward without destroying our environment. Knocking down old buildings to build green buildings is not sustainable. Loyola is a leader in sustainability and we are at a tipping point. 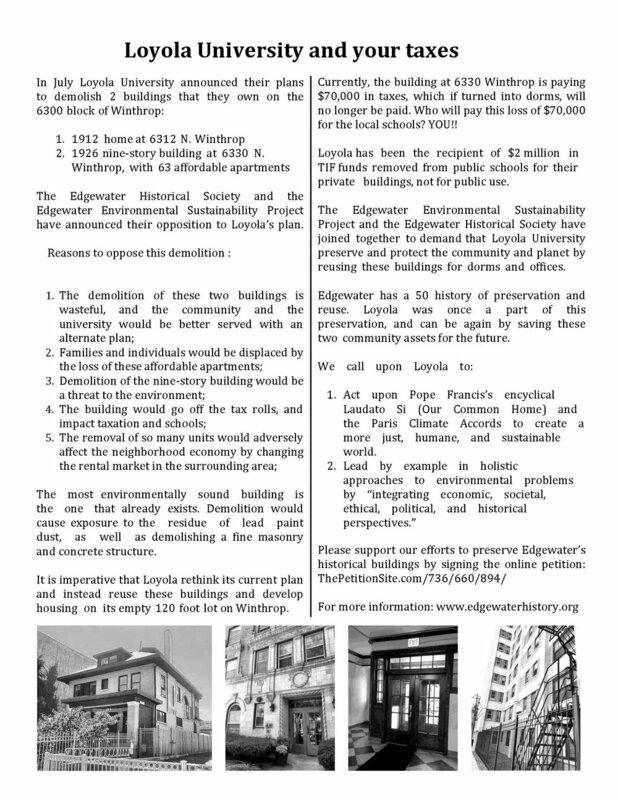 Edgewater Environmental Sustainability Project, Edgewater Historical Society, 6018North, and Edgewater neighbors —exhort Loyola to use this opportunity to honor people over profit! Who gains????? Do students gain with dorm & tuition already at $58,000? Do neighbors gain with Loyola not paying $70,000 yearly taxes? We urge Loyola to forge a divergent path that honors the past, seeks to preserve history and community, demonstrates their belief in the environment and their commitment to a larger community of people beyond Loyola students, while providing their students with beautiful housing. I. Please call Alderman Osterman at 773. 784.5277 and ask him to deny Loyola’s variance. It’s the only option we as a community have. What is he doing to protect low income housing? How is he keeping Edgewater’s diversity? Diversity is created by diverse housing stock not cookie-cutter dorms. Who will pay the $70,000 taxes for local schools that Loyola will now not pay after Loyola knocks down the buildings? How is he continuing the neighborhood's legacy of preservation begun by his mother? Thank you for reading this far. This is not just in Edgewater but in Pilsen, Washington Park, all over the City. Who has the right to define the world we live in? Who are our elected officials accountable to? How do students make their educational institutions accountable to them and their future? Banner image credit: William Estrada. Below images: William Estrada silk screening bags for Loyola students.